Guangzhou, Nov 25 (IANS) On a mixed day for India, Vikas Krishan won the gold in the men's 60 kg boxing but compatriot Dinesh Kumar settled for silver after losing his bout in the 81 kg weight category in the Asian Games here Thursday. Krishan beat China's Qing Hu 5-4 in a keenly fought bout while Dinesh lost 4-10 to a far superior Elshod Rasulov of Kazakhstan. Krishan was tied 1-1 with the Chinese after the first round but nosed ahead 3-2 in the second. The Indian showed superb defensive skills to restrict Qing, who made furious attempts to level the scores with the Chinese crowd staunchly behind him. The third round also ended on 1-1 but Krishan succeeded in sustaining the lead. It was India's first gold in boxing here. However, Dinesh failed to make it two in a row for India. The Indian was off to a poor start, trailing 0-1 in the first round before Rasulov stepped up the ante to stretch the lead to 2-5 in the second. The Kazakh continued to dominate in the third round (4-2) to put it beyond the Indian. 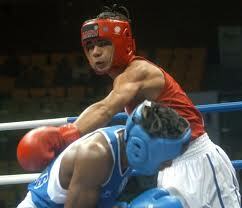 Five Indian boxers Wednesday put themselves in contention for gold medals. Apart from Krishan and Dinesh, Santosh Kumar Virothu (64kg), Vijender Singh (75kg) and Manpreet Singh (91kg) booked their place in the title clash after winning their semi-final bouts. The trio will take to the ring Friday. 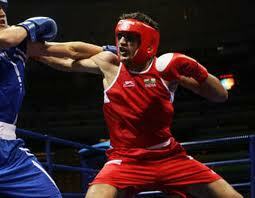 Besides the gold and silver, India have also won four bronze medals in boxing. Suranjoy Singh (52kg) and Paramjeet Samota (+91kg) lost their semi-final bouts to end up third. In the women's category, five-time world champion M.C. Mary Kom (51kg) and Kavita Goyat (69-75kg) ended up with similar results.